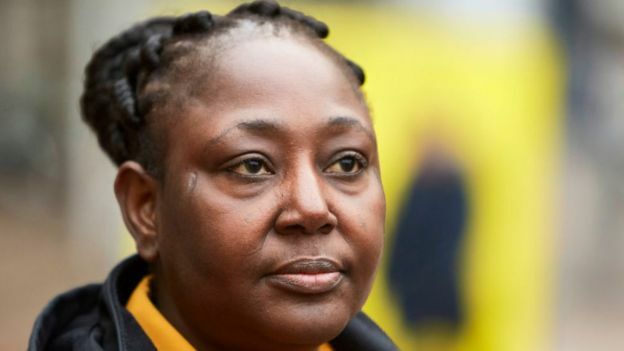 The widow of a Nigerian activist suing oil giant Shell over the execution of her husband says his death left her "traumatised" and "poverty-stricken". She is among four women who accuse Shell of being complicit in the hanging of their husbands by Nigeria's military in 1995. Shell denies the allegation. The activists led mass protests against oil pollution in Nigeria's Ogoniland. Their executions caused global outrage, and led to Nigeria's suspension from the Commonwealth for more than three years. More than two decades later, memories of the executions still move the widows to tears, reports the BBC's Anna Holligan from court. Mrs Kiobel wiped her eyes, and in a quivering voice described her husband, Barinem Kiobel, as "kind-hearted", our reporter adds. In a written statement, she said she had lost a "wonderful husband" and a "best friend". She added: "Shell came into my life to take the best crown l ever wore off my head. Shell came into my life to make me a poverty-stricken widow with all my businesses shut down. Shell came into my life to make me a refugee living in harsh conditions before l came to the United States through [a] refugee programme and now [I am a] citizen. "The abuses my family and l went through are such an awful experience that has left us traumatised to date without help. We all have lived with so much pain and agony, but rather than giving up, the thought of how ruthlessly my husband was killed... has spurred me to remain resilient in my fight for justice. "Nigeria and Shell killed my late husband: Dr Barinem Kiobel and his compatriots Kenule Tua Saro Wiwa, John Kpuinen, Baribor Bera, Paul Levula, Nordu Eawo and the rest [of the] innocent souls. "My husband and the rest were killed... The memory of the physical torture my family and l went through has remained fresh in my mind, and whenever l look at the scar of the injury l sustained during the incident, my heart races for justice all the more." In a statement, the firm said the executions were "tragic events which shocked us deeply". The statement added: "The Shell Group, alongside other organisations and individuals, appealed for clemency to the military government in power in Nigeria at that time. To our deep regret, those appeals went unheard. "We have always denied, in the strongest possible terms, the allegations made in this tragic case. SPDC [the Shell Petroleum Development Company] did not collude with the authorities to suppress community unrest, it in no way encouraged or advocated any act of violence in Nigeria, and it had no role in the arrest, trial and execution of these men. "We believe that the evidence clearly shows that Shell was not responsible for these distressing events." Then-UK Prime Minister John Major described the trial as "a fraudulent", and said it had led to "judicial murder". 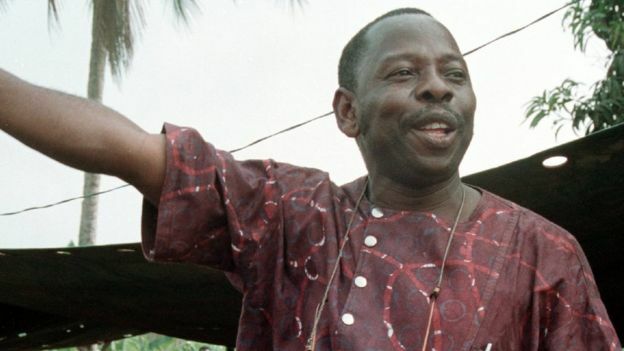 At his trial, Saro-Wiwa said the case was designed to prevent the Ogoni people from fighting against oil pollution which had devastated the region's environment and had caused poverty and disease. What did the other widow say? In her statement to the court, Victoria Bera said she was pregnant with her fist child when her husband, Baribor Bera, was arrested by the military. She said: "The detention and subsequent execution of my husband made things very difficult for the entire family, including other relatives who depended on his financial support. "I need justice. I need justice for my people."